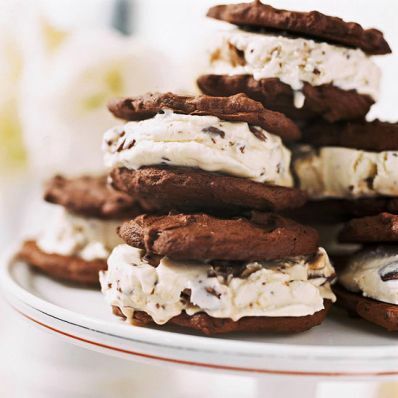 Although the candy-filled ice cream is yummy in this dessert, you can use any flavor ice cram you wish to fill the banana-chocolate cookies. 1 of 4 Heat oven to 375 degrees F. Grease 2 large baking sheets with solid vegetable shortening. In medium-size bowl, mix flour, cocoa powder, salt, cinnamon and baking soda. 2 of 4 In a large bowl, on medium speed beat together butter and brown sugar until smooth and creamy. Beat in sour cream, mashed banana, dissolved coffee and vanilla. On low speed, gradually beat in flour mixture. Fold in chocolate chips. 3 of 4 Drop batter by heaping tablespoonfuls onto prepared baking sheets, spacing about 4 inches apart; then gently spread and shape into 2-1/2-inch rounds. 4 of 4 Bake in 375 degrees F oven for 10 to 12 minutes or until cookies are set but still soft to the touch. Let cookies cool on baking sheets on wire racks for 1 to 2 minutes. Transfer cookies to wire racks; let cool completely. Repeat with remaining dough for a total of 30 cookies. 1 of 3 Line 2 large baking sheets with waxed paper. Spread 1 sheet of waxed paper onto work surface. With standard-size ice-cream scoop (1/4 cup), place 3 heaping scoops of ice cream on one side of waxed paper, leaving space between. Fold paper over ice cream; gently flatten into disks to fit cookies. Peel back waxed paper; transfer disks to flat sides of 3 cookies. Top with 3 more cookies, flat side down. Transfer sandwiches to prepared baking sheet. 2 of 3 Place sheet in freezer. Discard waxed paper on work surface; replace with clean sheet. Repeat with 3 more scoops of ice cream, and 6 more cookies. Transfer sandwiches to baking sheet in freezer. Repeat process 3 more times for total of 15 sandwiches. Save any remaining ice cream for snacking. 3 of 3 Once ice-cream sandwiches are frozen solid, about 3 hours, serve immediately or transfer to large resealable plastic bag. Sandwiches can be frozen for up to 2 weeks.